Johnson's machine-mountable laser detector is ideal for using red beam rotary lasers outdoors at great distances, when the human eye cannot see the laser beam, by quickly and accurately locating the laser signals. The detector features a large 360° detecting range, and with a bright LED display for easy reading, the detector displays the information you need to get your leveling job done quickly and easily. This detector comes with everything you need to get your jobsite up and running - including clamps and powerful magnets for attaching the detector to machines, an NiMH rechargeable battery pack, cable, charger, and hard-shell carrying case. 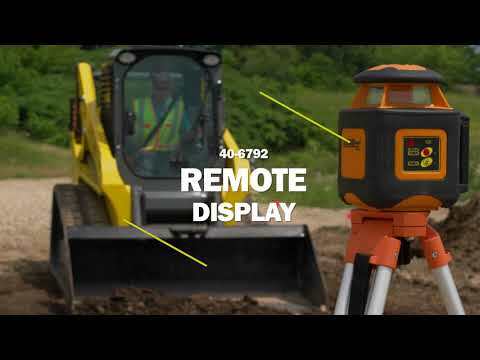 The detector can also be paired to Johnson's 40-6792 remote display to repeat the detector's display directly into the operator's cab of the equipment, making it ideal for use on skid steers and other equipment with limited visibility. This laser detector greatly expands the working range of any red beam rotary laser and is ideal for mounting to bulldozers, front-end loaders and backhoes. It is a must-have for building contractors, paving companies, excavation companies, concrete professionals, plumbers, landscapers and more! The laser detector pairs perfectly with any red beam rotary laser.